Changing the oil in your Land Rover Series 3 regularly is really important. So many people over look changing gearbox fluids when they do a service. With an older vehicle, especially a Land Rover its imperative that the transmission gets attention too. As you well know Landy’s love to leak. Normally all over the drive. If you have a leak from your transmission and you are a bit slack when it comes to oil changes or top ups then it wont be long before the oil level in your gearbox reaches a critically low level. With an old design and a tired gearbox, you need ever drop of oil in the ‘box. So lets take a look at changing the oil in your Series 3 Gearbox. We are going to drain and refill the fluids in your Main ‘box and Transfer ‘box. The type of oil to use is EP90 gear oil and you’ll need around 1.5litres for the Main ‘box and 2.5litres for the Transfer ‘box. First we will start with the Main ‘box. Finding the fill and drain plugs is easy enough. The drain is a the bottom close to the engine. The fill is almost directly above it on the left hand side of the gearbox. Its a good idea to take the filler plug out first, so you know that its not seized. Once the filler plug is out can get straight to draining the gearbox by removing the drain plug. Have a funnel and contained at the ready. As the Series 3 Gearbox takes a thick gear oil, you may want to leave it to drain for a while. Once you are happy its drained enough, its just a case of refitting the drain plug with a new copper washer and getting on with the job of filling the box up. You can use an oil pump or oil syringe to fill it with, these will make it a whole load easier and a lot less messy than trying to do it with a bottle or funnel etc. Next, is the transfer box. Attach it in the same fashion. Filler plug out, then drain. 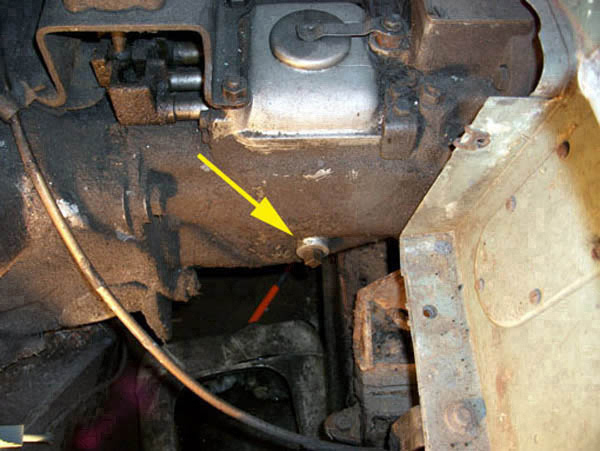 You can find the filler plug at the back of the gearbox to the left of the transmission brake. The drain plug is located at the bottom of the transfer box in the steel cover plate. Hopefully you change your fluids regularly and its not seized. Again, the filling process is the same. Perhaps a touch easier as you have more room. After both ‘boxes are filled, its worth cleaning up any spills or mess you made. This was you can keep an eye out for leaks easier. There is a good change that you didnt drain 1.5litres out of the Main ‘box and 2.5litres out of the Transfer ‘box. So you’ll probabily notice that the transmission quieter, maybe even smoother and that your Landy loves you again. For more information on the Series 3 Gearbox click here: Land Rover Series 3 Gearbox or for a quote please click the blue ‘Contact’ button on the left.